The Coliseum neighborhood is on dry land now, but residents should brace themselves for a damper future. 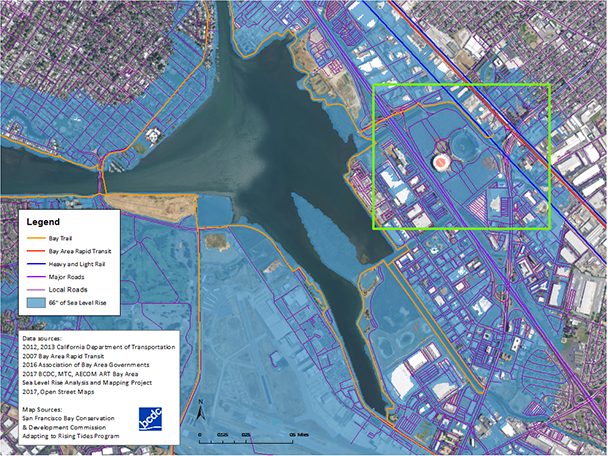 The San Francisco Bay Conservation and Development Commission’s sea level rise maps for the Bay Area show that two to four feet of sea level rise will cause a small amount of flooding around the stadium. But when the Bay is four feet higher, Damon Slough and Elmhurst Creek will inundate the low-lying stadium parking lot. Projections by the National Oceanic and Atmospheric Association and the United States Geological Survey show similar results. How long do we have to get ready? The most recent estimates from the State of California indicate that two feet of sea level rise is likely by around 2050, and four feet by 2100 even if we drastically reduce emissions. But the combined flood event – when a big storm adds to already higher tides and rising sea levels – could come much sooner. Want to see some Oakland specifics? The City of Oakland recently completed a sea level rise road map presenting potential effects on people and property of rising sea levels, king tides, and storms surges, and recommendations for how to get ready.